Forget clean and sterile. This proudly analog compressor is here to color and transform your audio in special ways. Everything from the discrete RMS detector to the proprietary tube and tape emulator circuits to the honking big transformer on the back of the module are all there to add some special analog sauce to your mix. Jellysquasher is an analog mono compressor and tone shaper made to dynamically fit within the eurorack world. All three COLOR circuits can be engaged in any combination to react differently based on the input DRIVE level and MAKEUP GAIN. 100% analog signal path and SIDECHAIN feedforward compressor with unique log-based RMS detector. 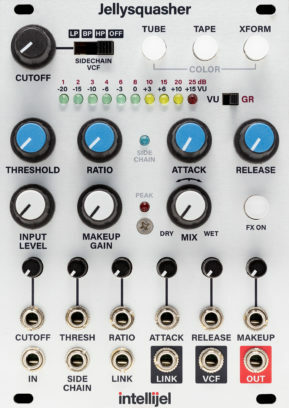 SIDECHAIN is routed through a voltage controllable SVF filter with LP, BP and HP modes. A trimmer on the PCB allows you to adjust Q. This filter can be used independently of the rest of the module. Full CV control of SIDECHAIN, VCF Cutoff, THRESHOLD, RATIO, ATTACK time, RELEASE time, and MAKEUP GAIN. Wet/Dry MIX control allows for “New York” style compression where there is a blend of the dry and compressed output signal. LED bar graph with selectable display modes to view the signal level in VU or the gain reduction in dB.